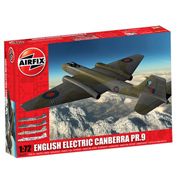 Airfix replica model planes are probably the most popular and well known part of their collection. 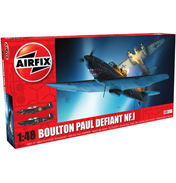 These kits have become so accepted over the years some people refer to other model kits as being Airfix even if they are made by another manufacturer. 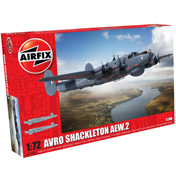 Here you will of course find ones made by Airfix. In this location we focus on the latter part of Military aviation history to present date, post 1951 onwards. 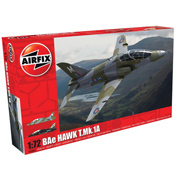 Again one of the most popular scales with modellers is 1:72, which are obvious for choice with their red boxes. Other scales are also included as alternatives. The years after World War II led to great developments in aviation technology. The Second World War had led to a fast pace of military aircraft production and after this time commercial aviation also grew rapidly as they used ex military aircraft which were readily available and the De Havilland Comet was the first commercial jet plane to fly. However due to problems with that design in operation it was the USSR and their Aeroflot which was first able to offer a reliable regular jet service. 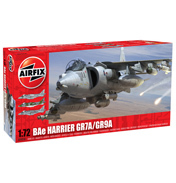 Military aircraft became more and more advanced and the UK designed Harrier is a popular choice for model making. It was also nicknamed a jump jet as it could take off vertically (V/STOL) using something called thrust vectoring which is where the thrust angle can be controlled in such a way as to affect attitude (part of flight dynamics and way too technical for us to cover here) and direction. Given this ability of short take off and landing it is a good choice for aircraft carriers who use it in conjunction with a short sloped runway. 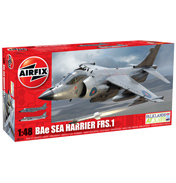 The main variations of this aircraft are included here which are the Hawker Siddeley GR3 Harrier (from the first generation series with GR1 being in use by the RAF back in 1966), the Sea Harrier by British Aerospace (BAe) as well as the Boeing and BAe Harrier II. 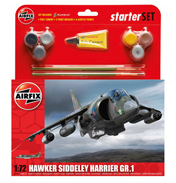 The GR5, GR7, GR9 and also the Harrier II are essentially redesigned versions of the original Siddeley series. 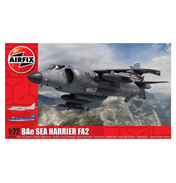 As are the Naval jet fighters the Sea Harriers FRS1 (dating from 1980) and FA2 (released 1993). 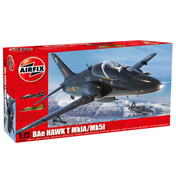 The BAe Hawk is another jet still in service by the RAF and is mainly used for military training and as it is highly manoeuvrable it was adopted as the plane of choice for the UK aerobatic team, the Red Arrows. Series T Mark I was the first version dating back to the mid 1970’s and the more modern advanced model of today is the 128 (Hawk T2)/132 series. If you are lucky enough to be able to see RAF training exercises in action one of the most recognisable in the sky is the Eurofighter Typhoon with its triangular shaped delta canard (duck) wing. It is a European consortium built craft, the proposal of which originally dated from the 1970’s, however its first flight was not until 1994. It has unrivalled technology and performance making it a truly exceptional aircraft. 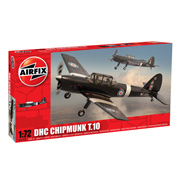 The RAF also used the training aircraft De Havilland Chipmunk from WWII until 1996 as well as the English Electric Canberra, a high altitude bomber, from the 50’s through to 2006 – Series B1 being a prototype, B2 being first in production (the B20 being same craft with extra fuel tanks in wings) and B (I) 8 being a third generation craft, and the PR9 being a Photo-reconnaissance version. The English Electric Lightning is a supersonic jet fighter plane from the times of the Cold War. 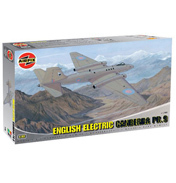 The RAF also used the Nimrod MR1 and MR2 until 2010 and this was due to be replaced by the Nimrod MRA4 however this project was cancelled and unfortunately Airfix at the moment do not carry this model much to many a modellers disappointment. The Royal Navy used the Hawker Siddeley Buccaneer from 1962 before passing to the RAF in 1969. 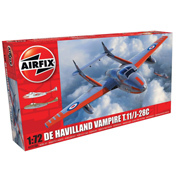 Also the de Havilland Sea Vixen became known as the Hawker Siddeley Sea Vixen FAW. 2, this plane has a twin boom tail and was one of the first to solely have missiles and bombs and this one was used too by the Royal Navy’s Air Fleet Arm. Another extraordinary aircraft only recently retired in 2008 was the Lockheed F-117A Stealth Nighthawk used by the US Air Force. This was specifically designed to deflect radar which explains its unusual shape. Other USAAF planes include the 1950’s Martin B-57B Canberra. From the Argentinean Air Force we have the FMA IA 58A Pucara which they used in the Falklands war. And the French Air Force used the Dornier Alpha Jet from 1973-1984 and also the Mirage F1 which was introduced in 1973. British Aircraft Corporation planes include the Strikemaster for training and light attack. In this century future technological advancements focus on subsonic, and remote or autonomous operation. So watch this space! Going back to Airfix modelling of airplanes, one of the more satisfying jobs is applying the decals to your finished aircraft. Decals are a form of transfer and they come on special thin paper which allows the decal to be transferred onto the model. They usually have designs such as military insignia (and in the UK Airfix actually have to pay the Ministry of Defence a licence fee for their use!). The use of Decals is actually written down in history as during the late 1800’s it became all the rage and a word was invented as a result – Decalcomania, and sometimes they are known by this name, however the word decal actually comes from a French word Decalquer which means to copy by transfer. There is a bit of an art to applying these perfectly and the process involves first cutting the decal sheet as required and then dipping in warm water for a very short time, seconds in fact. This loosens the water soluble glue and allows the backing sheet to be slid off and transferred onto the model. It is imperative that the decal isn’t kept too long in the water otherwise all of the glue will dissolve with nothing left to stick it to the aircraft.